From Book IV: Remembering. Fourteen-year-old Anna is accidentally crosses into and gets stuck in a menacing and unpredictable netherworld called The Wyssun’ World. She just had an encounter with a creature others refer to as a counsilor, and now is trying to learn more from the only guy who is willing to answer her questions, Scout Semille. “If anyone looks dead inside, that would be that Counsilor guy… By the way, is it Councilor like in town council or Counselor like in school counselor?” Anna wasn’t really that bookish, she just felt like showing off. “Well, Counsilors do offer their counsel and they are on the Council, so you can say, it’s both.” Apparently, the Scout took her wisecracking seriously. After he was a Dark Ages barbarian but before he became a model modern day male, he was Lord Yaret, a Counsilor of the Wyssun’ World. Girl In The City: What Are You Dreaming Of? Their encounter was anything but friendly, at least according to Anna’s recollection. He was intimidating. He harassed her at every turn. He promised to kill her, and even tried. She was lucky to get away. Nevertheless, she would lie if she said that after their ways parted in the Otherworld, she never thought of him. Also, it would be a gross mistake to think that Lord Yaret never checked on Anna. What are you dreaming of, little girl? Before Anna was married to an elf, before she was a practicing clinical psychologist, before she was a grad student, before she was a high school rebel, before she was an angsty teenager trapped in the Otherworld – she was just a kid. I had the weekend all to myself, so here is the finished – more or less – costume of Llewelys Dé Moire. Llewelys is the one who helps the teenage Anna when she accidentally shifts dimensions and ends up in the Otherworld. Llewelys is ancient, he was a friend of Yaret’s father, Yarboneo. For an Alva, he holds a rather positive view of humanity, nevertheless, he always wears armor. In Celtic mythology creatures of Otherworld often wear feathers as an element of their costume. I tried to incorporate that. There are several references to the footwear of the Otherworldly beings as metallic. I interpret it as the Alvan high tech, thus silver soles and metallic shading. The belt is purely for decorative purposes. Despite his frequent contacts with the primitive races, Llewelys does not carry weapons, relying on defensive magic instead. The armor is meant as more space-alien than medieval, however, Alvan love of nature is reflected in the leaf motif. The faceted droplets are amethyst and blue topaz on the belt and aquamarine at the shoulder. The overall look. There are three garments altogether: the transparent two-tone silk undergarment, a frock in silver raw silk with feather-trimmed sleeves, and the armor overshirt. His facial decoration is actually silver with some sparkles, which, unfortunately, didn’t translate in the photo. Fourteen-year-old Anna is caught up in a snowy netherworld populated by strange characters (misspelling of the word Counsilor is intentional 😉 ). From Homecoming, Book IV: Remembering. At first glance, he looked like a skinny teenager, but there was something ancient about his smooth face. That which in the features of the others was beautiful, in his face seemed grotesque, as if every part was taken to extreme. The eyes were too big, the nose and mouth too small. His large, elongated ears stuck out, and his skin seemed stretched too tightly over the delicate bones. A long white mane fell over his shoulders, cascading down his back, blending with the long tunic. There was a bird-like quality in the way he cocked his head and moved his fragile body. On the man’s shoulder sat a little white fluffy animal. The man bowed, so that the little creature, which was hiding in his hair, almost fell off his narrow shoulder. Others returned the bow with reverence. ‘Now, this is the real leader,’ thought Anna. “Hunter brings one human, true.” The white-haired man’s quiet voice sounded half-questioning, half-affirming. “I thought Hannah is a new Hunter…” whispered Heylard miserably. “Scout verifies one human, true,” the white-haired man continued, half-closing his enormous almond-shaped eyes. “True. Counsilor Llewelys, it’s a young female,” responded the guy in the green parka. For a moment, the pale Counsilor studied Anna with a tiny frozen smile that made him appear bored and amused at the same time. “Skiers,” he finally announced, “The Rules of the Seventh Approximation stipulate: If one human comes, it stays until it becomes. If one Skier brings one human, human stays until it leaves. True.” Having uttered this, he turned on his heels and made his exit through the front door. The doll I chose to portray Counsilor Llewelys is a legendary Dollshe Hound, in White Skin. 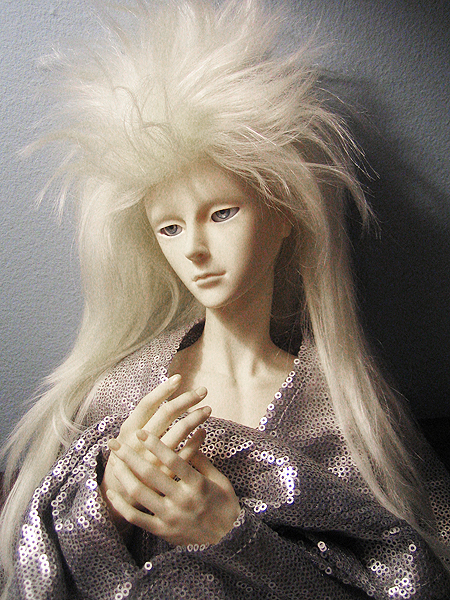 I just got him today, after many years of coveting this rare and hard to get doll. Full makeup and outfit will follow soon.